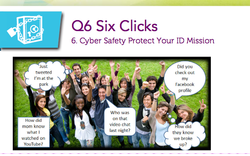 Digital Citizenship and Cyber Safety are important parts of our world today. To get a better sense of what these mean and how to apply them to your life and your work you are going to work through a Cyber Safety Mission provided by 21things4students. To begin you will need to click on the image to the left. Begin by watching the video and reading the briefing. Begin by working through QUEST 1 - Bill of Rights. Click on each link, working through Steps 1 - 5. Steps 4 and 5 may be done in pairs or table groups. The final draft of your Bill of Rights (whatever form you choose to present it in) MUST be posted to your blog. This assignment is about online privacy and whether or not there is such a thing. There are five (5) steps to be completed. Click on the image to the left to get started. Once you have finished Step #5 (creating your personal CyberShield) post your Shield (as an image) to your blog and write a explanation of what you put on it, why and what it means to you.